Redwood National Park offers so much, here's a well rounded approach to taking it all in RNP has 133,000 total acres, 40 miles of pristine coastline and 45 percent of all the remaining coast redwood. 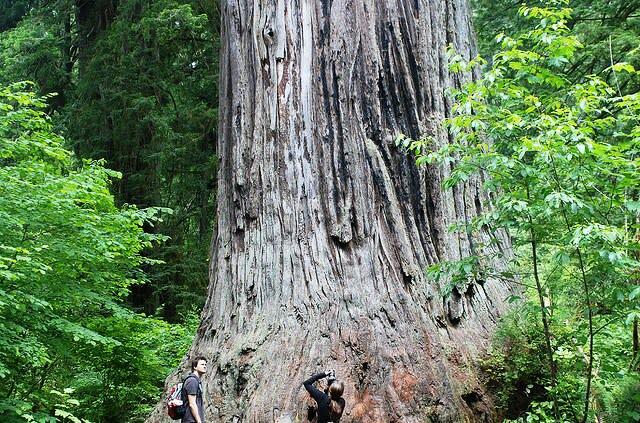 Follow this itinerary for Redwood National and State park to experience the best it has to offer. As you drive north of Orick on Hwy 101 and enter Redwood National Park you’ll notice there is no official park entrance like you might see at other national parks. Don’t worry, this is just as much of a national park as any of the rest and the bonus is you don’t have to pay a park entrance fee like you do at other national parks. Day One: One of the first places you’ll come to is the Kuchel Visitor Center just a little north of Freshwater Lagoon/south of Orick. Stop in here to pick up information on the park, explore exhibits, check out the bookstore, see a park film or just stop in to use the restroom. You can also get information about the ranger-led activities and programs (summer only) and Junior Ranger programs (summer only), and pick up an activity booklet for the kids. A must see in RNP is Fern Canyon. This level trail of about one mile follows Home Creek as it courses through the forest. The modest stream has over the eons carved a deep (50 to 80 feet) canyon through the sedimentary soils. The vertical walls sprout an amazing variety of ferns (five different kinds) and other moisture-loving plants and mosses. Depending on the time of year, there is a constant drip-drip of water trickling down the canyon walls. Click on the Fern Canyon link above for driving directions. 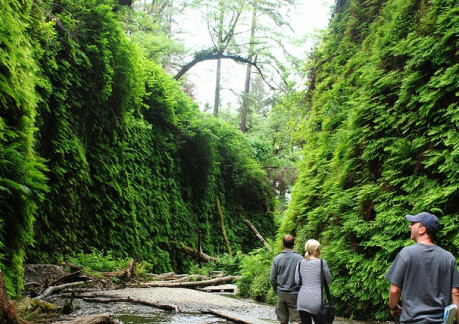 An even better way to see Fern Canyon is by hiking to it. One of the most popular hikes in RNP is the James Irvine Trail. 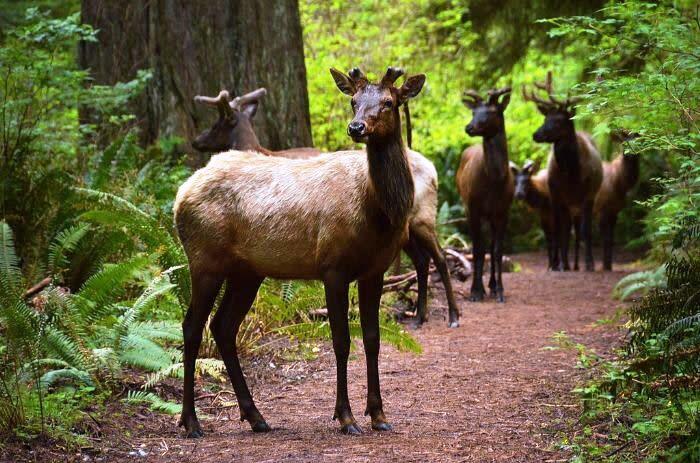 This trail starts behind the Prairie Creek Redwoods SP Visitor Center. 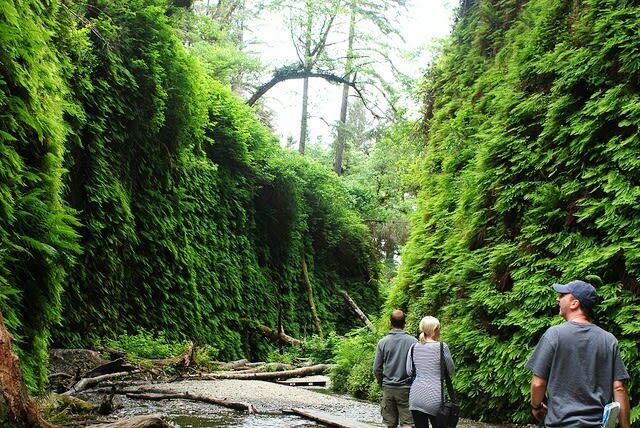 This moderate hike travels along Godwood Creek through majestic forests to end at the world-famous Fern Canyon and Home Creek. After arriving at Fern Canyon, walk out to Gold Bluffs Beach to enjoy the ocean. You can hike the James Irvine Trail back or continue on the Coastal Trail, Gold Bluffs Beach section and link up with Miners Ridge for a strenuous return trip. There is plenty of camping throughout the park. Choose from Elk Prairie Campground (open year round), Gold Bluffs Beach Campground (open during the summer), backcountry camping, or if you are not up for camping stay at one of the various lodging facilities in the area. Go to Lodging and select the Mckinleyville/Trinidad/Orick area option. Day Two: Take a scenic drive along the Newton B. Drury Parkway and stop along the way and see Big Tree measuring 304 feet tall and 21 feet in diameter. Continue up the parkway to Hwy 101 North. Just after you cross over the Klamath River bridge take the Klamath Glen Exit to the Tour thur tree where you can Drive thru a Redwood. Continue north on Hwy 101 to the Trees of Mystery just north of the town of Klamath. The Trees of Mystery features several unique trees as well as a gondola ride through the trees to the top of the mountain. The Trees of Mystery also has an extensive Native American museum. 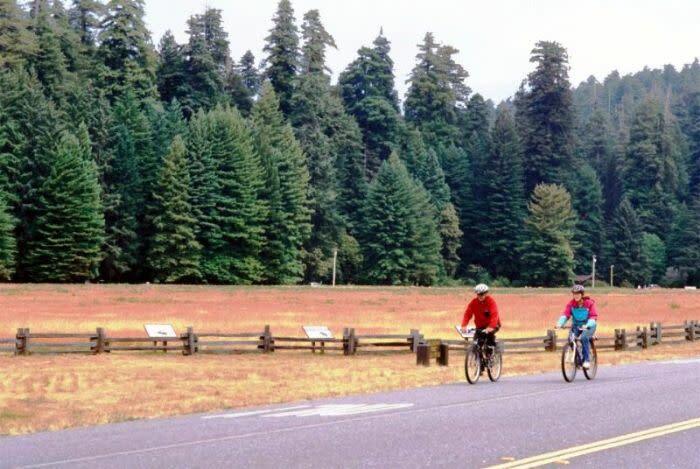 Two great ways to take in the redwoods is by bike or horse. Here is a map of the bike trails in Redwood National Park. If you don’t have a bike you can rent them from Redwood Adventures and they also offer guided mountain bike tours through the redwoods. Horseback riding tours are great way for the whole family to see the redwoods. Redwood Creek Buckarettes offers guided horseback ride tours through the redwoods. If you’re visiting in the summertime take advantage of the ranger led campfire programs. As darkness descends on the North Coast Elk Prairie campground in RNP is the ideal setting for an informative and inspiring night cap. Programs may include narrated slide shows, storytelling, music, and/or games. Campfire circles and outdoor amphitheaters are wheelchair accessible. Dress for cool summer evenings. If you’re looking for a place to dine, you’ll find some very nice restaurants in nearby Orick or Trinidad. Here’s a list of restaurants close by: The Palm Café in Orick, the Moonstone Grill, Sunset Restaurant and Ocean Grove Restaurant, all in Trinidad.